You want your home to not only look elegant but to also feel cosy and welcoming. So you go for the most expensive woollen carpet in town. Your plan works well. Your home exudes elegance, feels warm and is welcoming. But three of four months down the line, the carpet starts stinking. It fills your living room with a bad odour that refuses to go. You vacuum the carpet several times during the day, you even use air fresheners but the odour doesn’t go away. This is of course, embarrassing. But don’t worry. It happens to so many people. Here is a list of seven reasons why the odour doesn’t go away and solutions that can come to your rescue. This happens a lot. It gets worse where you have a cat and a dog at home enjoying the warmth of your carpet in equal proportions. Dog urine is simple to clean. Not so with car urine. It stinks and often comes along with a musty feeling. There are two easy ways to prevent the problem. First off, discouruge your pets from playing or sleeping on the couch. Then ensure that the pets are trained to use pet relief areas. For cleaning off the mess, use a half a litre of white vinegar and a litre or water to make a cleaning solution. The solution can get rid of the stain and odour within a short time. You must however, clean up the mess as soon as you notice it. This is by far the most stubborn source of carpet odour. You vacuum your carpet on a daily basis. The one day out of the blues, your feel a musty, earthy smell. You ignore it at first you even open your windows and get a temporary relief. But the musty smell doest go away no matter what you do. Lift the carpet, take it out for aeration and look for traces of mould. Then note that mould infestation spreads quickly. That means you have to consider consulting a mould remediation service provider. Note too that humid areas are more prone to mould infestation than areas with averuge levels of humidity. You may therefore have to inspect your carpet and rugs for mould regularly if you reside in a humid area. 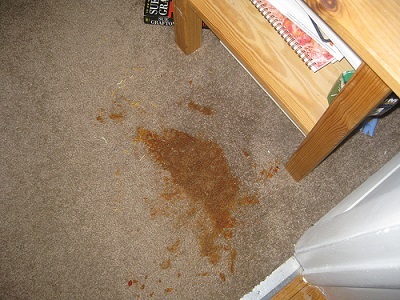 You may not notice food debris spilling under the carpet. Over time such debris accumulates and many stink. Spills from hot drinks can make the odour worse. There is a simple solution to this problem. Simply clean up the mess every time you spot food debris. Remember dirt and food debris can easily attract pests, which can worsen the odour coming off your carpet. This happens in both commercial and residential areas. You fumigate your home and rodents die. Some find a home under your carpet and die there. It may take a day or two before you notice something is wrong under your carpet. You will eventually know because it is easy to know the smell of a dead animal. It could be a lizard or a mouse. Be on the lookout for rodents that may try to escape fumigation by seeking solace under your carpet. Lizards and non venomous house snakes are often the biggest culprits. Watch out for them and get rid of them at your earliest convenience as they can also be life hazards. Mildew and mould are pretty much the same. They can also spread quickly to other areas and cause a musty, unpleasant smell. Fortunately for mildew, you can always use simple home remedies. You also don’t have to worry so much about mildew and your health. Unlike mould which can worsen asthma and cause pulmonary oedema, mildew can only cause migraines and common colds. Take note though that prolonged exposure to mildew can cause serious breathing complications. Remediate your home the moment you feel that musty mildew odour coming off your carpet. This is pretty much obvious. Socks, especially if you or any of your family members suffer from athletes feet can force make your carpet stink. The solution in such instances is simple. First off, observe hygiene. Wash your feet or put on clean socks before walking on your carpet. You can also use strong air fresheners to mask the mild odour often associated with athlete’s feet. Your carpet may look clean. It could actually be clean. After all, you could be a clean freak – vacuuming your carpet every weekend or even every day. Unfortunately, even the cleanest carpets will always stink if you fail to air them. You don’t have to air your carpets and rugs for long. Simply air your carpet under the sun for at least three hours under the every month. For area rugs, air them as often as you can.